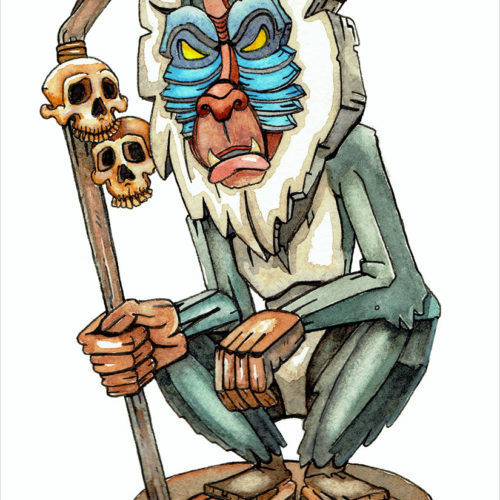 This piece was inspired by Animal Kingdom and all the entertainers they have dancing around. The shield references to one of the many horned animals that live in the park and the staff hosts a hidden Mickey. 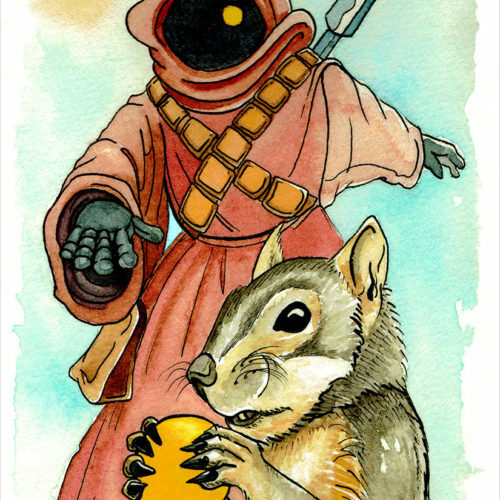 The original painting is made with watercolor and ink on 140 lb. cold press paper. 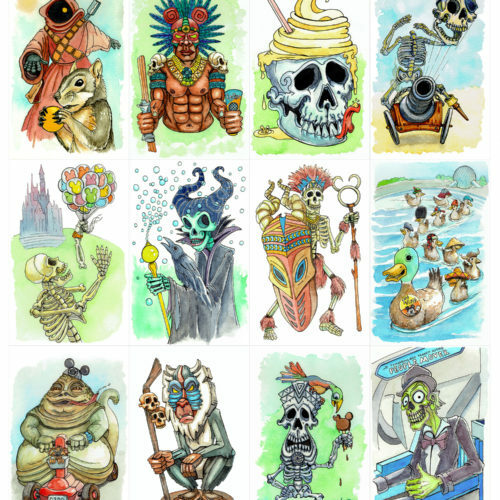 It measures 5.5″x8.5″ unframed and comes in a clear protective sleeve with a stiff backing. The squirrels at the Disney Parks are some of the most brazen little creatures I’ve ever witnessed. We watched one go from stroller to stroller and just ransack everyones left overs and bags. The day before, we were in Hollywood Studios at the Star Wars Launch Bay, where we met a couple of Jawas. Apparently they will trade little trinkets with you if you ask them to, but for some reason they refused my offer and traded with my wife instead. I tried a few more times to trade things with them but nope they weren’t into it. 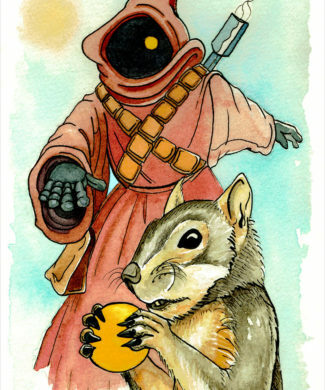 So that’s why I made this painting of sweet squirrel vengeance! Maybe now they will trade something for their eye back! One of the highlights of visiting any Disney Park is eating all the things!! 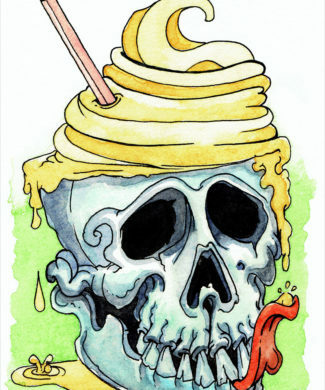 I really wish they would start serving Dole Whips in skull bowls. 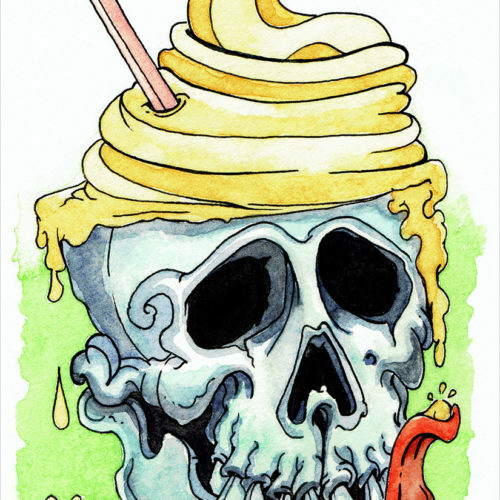 This skull can’t even resist the sweet soft serve spilling out of his cranium. Ducks, ducks, and more ducks! At every Disney park you go to, you see the happiest ducks in the world! 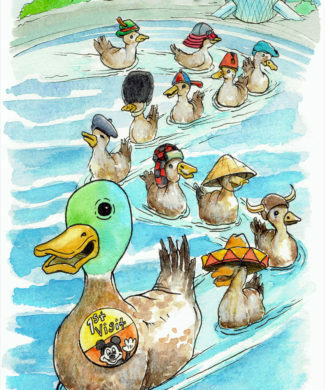 This piece shows a mother duck taking her ducklings around the World Showcase at EPCOT. She is wearing a first visit pin because she has never left. 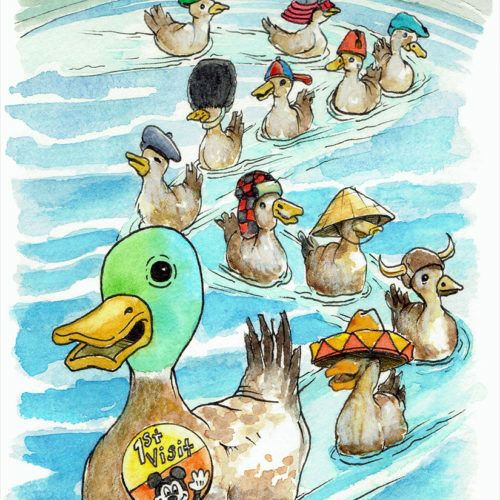 Each duck has a different hat that represents one of the eleven countries in the park. 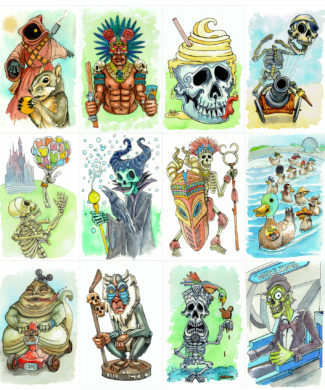 See if you can identify them all! My favorite country in the World Showcase at EPCOT is also the place my family is from, Mexico. 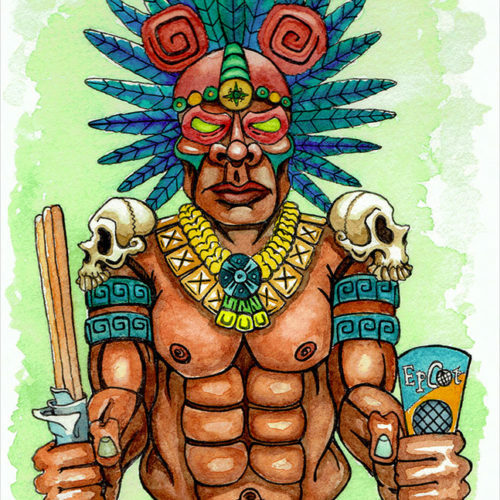 If Aztecs invented Churros this guy sure wouldn’t have those abs. 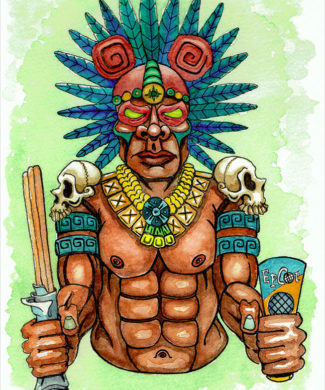 This fierce warrior is shown in Mexican style Mickey ears and is trying to find his way around the big wide world of EPCOT. “Every Dog Has His Best Day Ever” is centered around the Haunted Mansions biggest underdog. 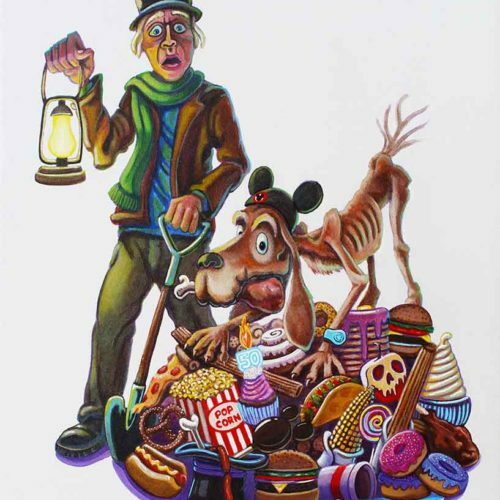 The piece depicts two of the only living characters in the whole ride, which are the Caretaker and his dog Bones. Being dog lovers, every time my wife and I go on the ride we always talk about how we wish we could throw that poor dog a turkey leg or churro to help fatten him up! So I decided what better time than the Haunted Mansions 50th Anniversary to give this dog his best day ever. 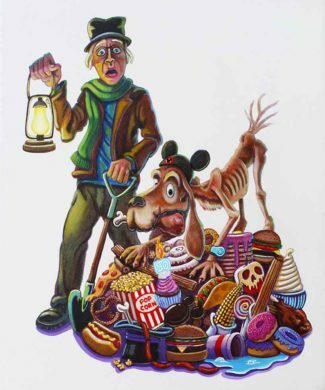 Bones is shown standing on a pile of Disney snacks with a turkey leg in his mouth, Mickey Ears on his head, and a Magic Band around his leg. His owner looks on astounded and is in disbelief that he has left the Mansion and is out cruising the park! The painting is made with acrylic on a mounted Birch panel and measures 12.5″x15″x1.5″ and is ready to hang. “Head Shot” is my personal favorite of this series. It was inspired by the Pirate theming around Pirates of the Caribbean in Adventureland. 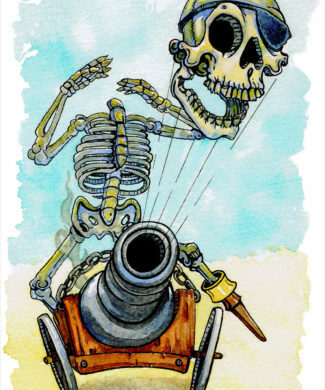 A skeleton pirate fires his own head through a cannon as a last resort in hopes of winning a battle. I like to think that he is going to bite and clamp onto whatever or whoever he hits. 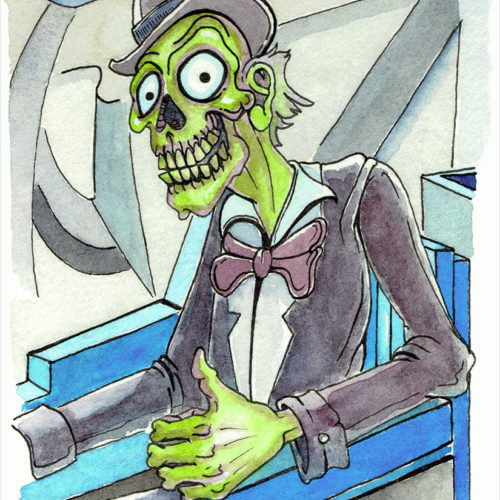 This hitchhiking ghoul finally got a ride! Too bad the People Mover is going to drop him off right back at the same place he got on. 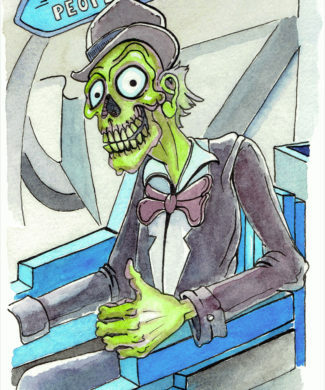 This piece is a combination of two rides The Haunted Mansion, which is one of my favorites, and the other is the People Mover, something I go on just because Rachel wants to. 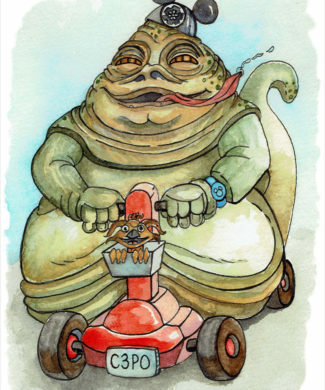 “Jabba’s Best Day Ever” shows Jabba cruising around on a Rascal Scooter with C3P0 plates. 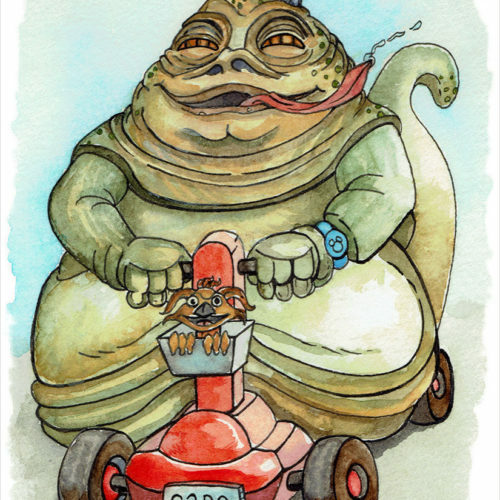 His Kowakian monkey-lizard side kick is navigating through Hollywood Studios because they don’t want to miss their reserved seating for the Galactic Spectacular! 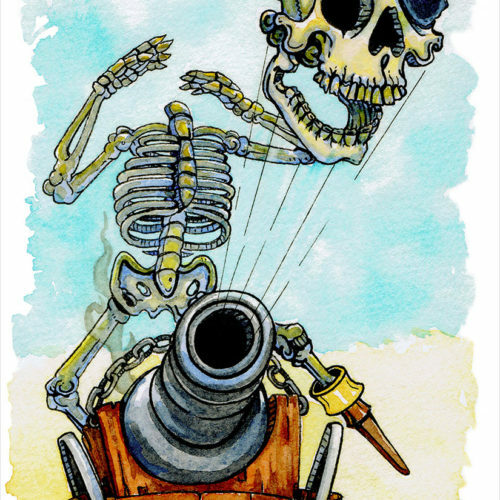 Fine Art prints only come in the original size of the piece 5.5″x8.5″ and are printed on German Etching with an archival pigment based ink. They come individually wrapped in a clear sleeve with a stiff backing. “Out of Reach” was inspired by Main Street at the Magic Kingdom. 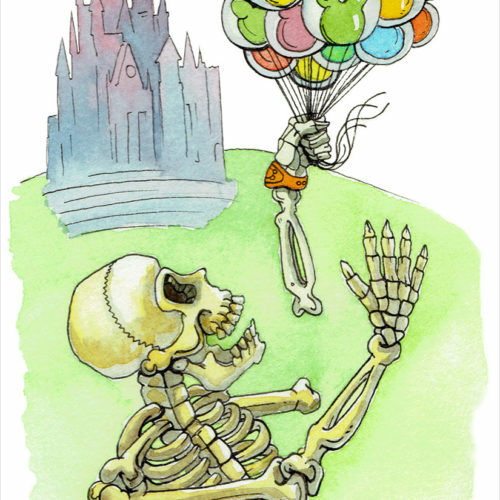 It shows a skeleton who lost his arm to the mighty strength of Mickey balloons. The worst part is that his Magic Band is on that arm and he had a Fast Pass scheduled for Seven Dwarfs Mine Train, Peter Pan’s Fligt, and Space Mountain! 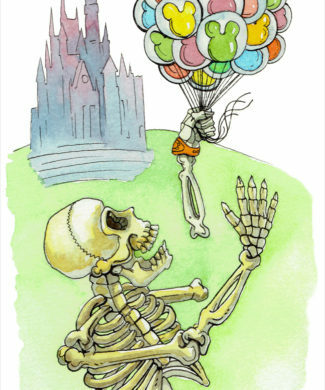 Looks like it’s Stitches Great escape for this skelly. 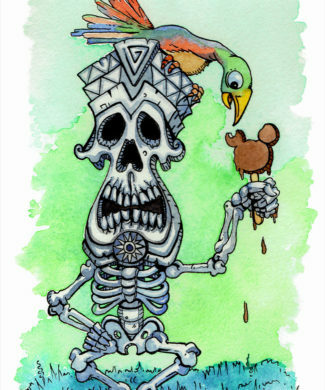 This little Watercolor was inspired by the Magic Kingdom but more specifically Adventrueland. Adventureland is by far one of my favorite parts of any park! 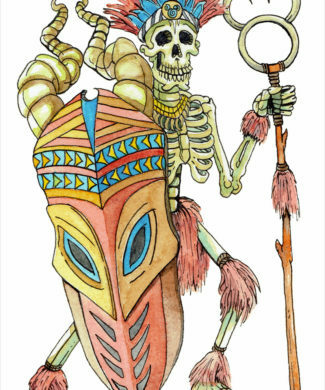 This tiki skeleton character is a combination of the tiki room mixed with a little Pirates of the Caribbean. 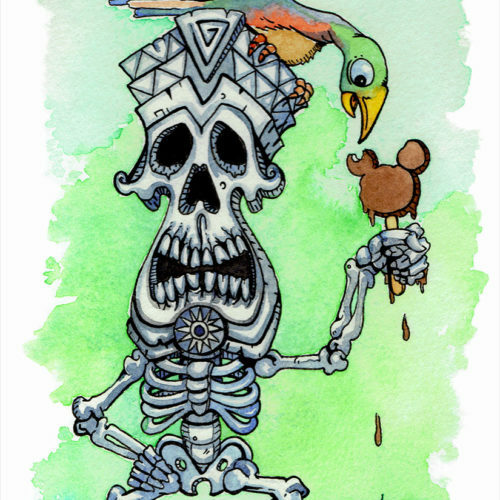 He is eating a melting Mickey ice cream while a parrot from the tiki room joins in! 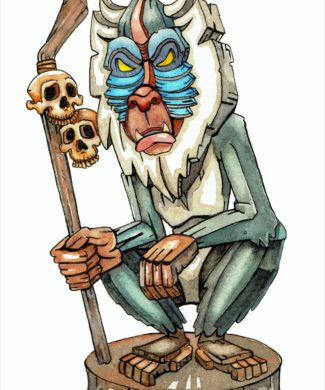 Rafiki is one of my favorite characters from the Lion King and he is so cool that he even has a whole section at Animal Kingdom devoted to him, “Rafiki’s Planet Watch”. 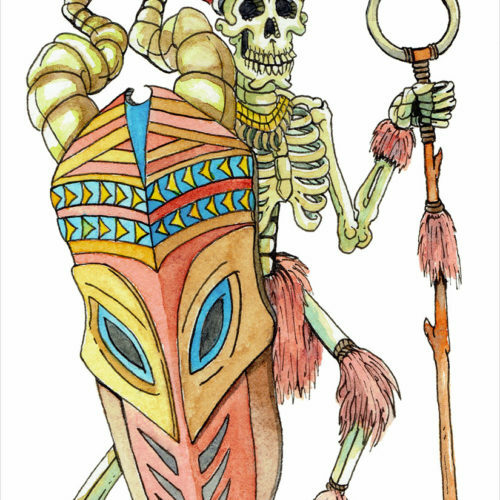 I tried to make him a little darker of a character by replacing his gourds on his staff with skulls and gave him a more angular design reminiscent of a tiki carving. Set of 12 park inspired prints. Printed on a textured fine art paper and comes in the size of the original paintings 5.5″x8.5″. Each print comes wrapped in a clear sleeve with a stiff backing. 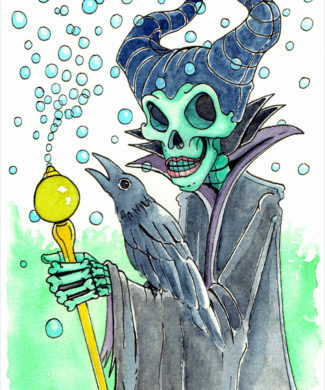 This is my version of the Mistress of all Evil! 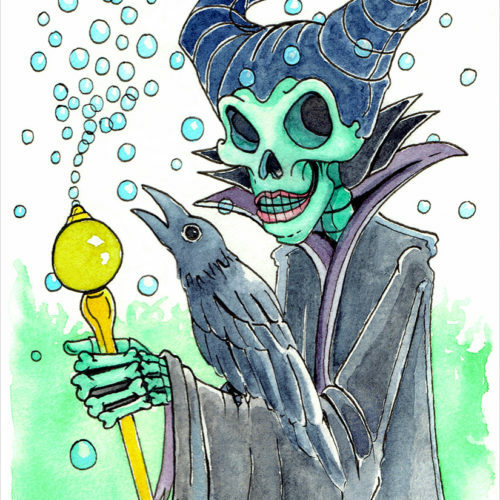 Maleficent working the bubble wand. At all the parks there were gangs of bubbles floating around every twenty steps. It seemed like all the strollers just had these bubble wands built into the wheels.